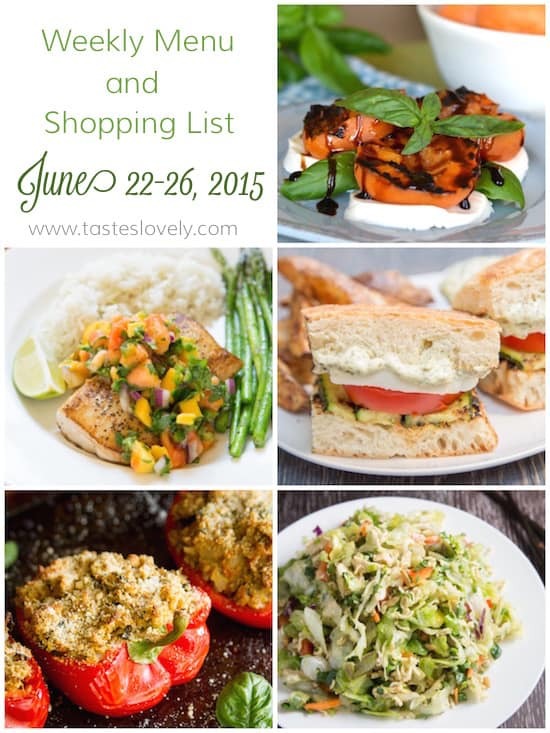 Weeknight dinner meal plan and grocery shopping list for the week of June 22-25, 2015. The meals and grocery shopping list is for a family of 4 (or family of 2 who likes leftovers!). Sunday Prep has tips on prep work you can do in advance to make these weeknight meals even faster to prepare. Click all of the meal links below for the printable recipe, and at the end of the post is a printable shopping list. Grilled Zucchini Caprese Sandwich served with wedge cut fries // Grilled zucchini, mozzarella cheese and tomato stopped with a pesto mayonnaise. A perfect summer sandwich. Served with my very favorite oven baked potato wedges. Ramen Noodle Chinese Chicken Salad served with pan fried pot stickers // My husbands very favorite salad. Crunchy chinese chicken salad topped with ramen noodles. Served with pan fried potstickers (buy frozen, cook according to manufacturers instructions). 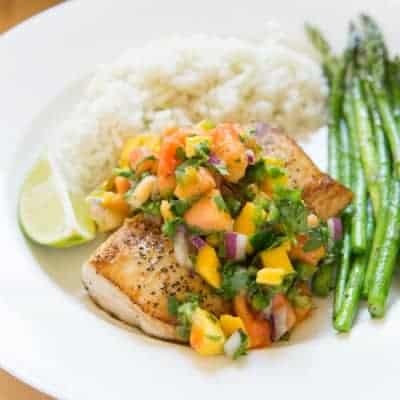 Make the mango papaya salsa for Tuesday. Refrigerate in an airtight container. Make the coconut lime rice for Tuesday. Refrigerate in an airtight container. Microwave for 5 minutes and fluff with a fork when ready to eat. Make the pesto mayonnaise for Wednesday. Refrigerate in an airtight container. Shred the rotisserie chicken for Friday. Refrigerate in an airtight container. Make the salad dressing for Friday. Refrigerate in an airtight container. 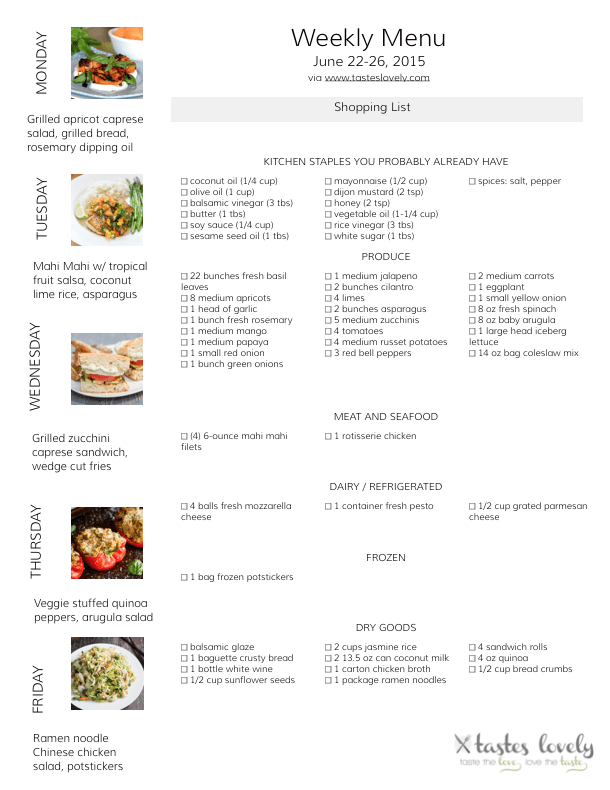 Click here for a printable version of the weekly menu and grocery shopping list. Check out all my weekly menu and grocery shopping lists for more menu planning inspiration. I am loving your weekly meal plans, Natalie! I want to try every single one of these recipes! And this week I’m making your vegetable lasagna. I can’t wait! This is another great menu, Natalie! I always seem to read this in the morning, so you’re making my mouth water at 6am! 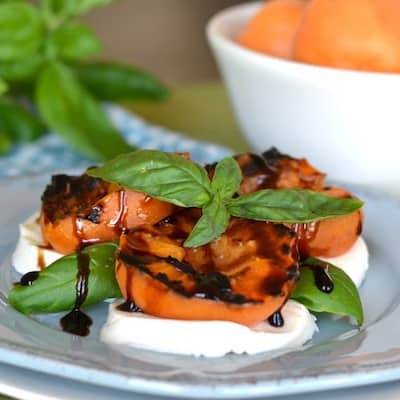 I can’t wait to try the apricot caprese salad and mahi mahi…delish! Natalie, I love that Grilled Apricot Caprese Salad!!! I can’t wait to try it!!! and I love that Ramen Noodle Chinese Chicken Salad!!!! delicious! what a great meal plan for the week! You make the best looking healthy dishes, Natalile! My mouth is watering over your menu this week. 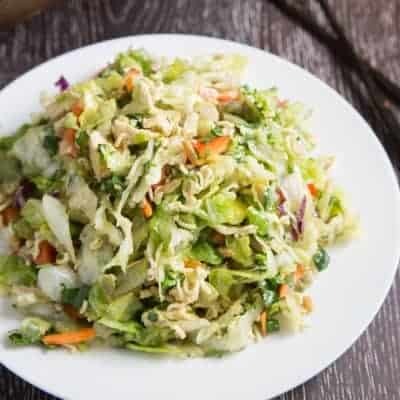 Chinese ramen salad is my husband’s favorite too and it sounds perfect with pot stickers. 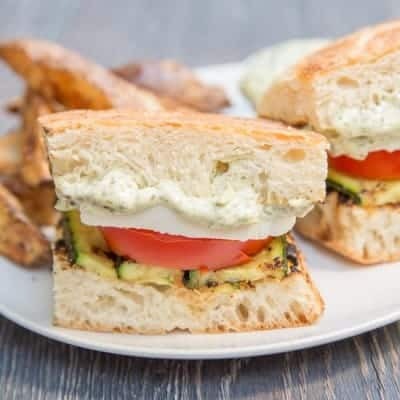 I wish I had your grilled zucchini caprese sandwich for lunch right now, so delicious! You amaze me with these menu plans! I hope someday to be as organized as you are! I love prepping meals on the weekend — makes life so much easier! Another amazing looking menu! You are totally helping me get more organized with my weekly meal planning! This all looks amazing, Natalie! As always :). Hello! 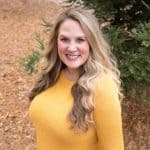 I just stumbled upon your blog and I love meeting fellow CA food bloggers! Your menu this week looks delicious! Fabulous recipes. 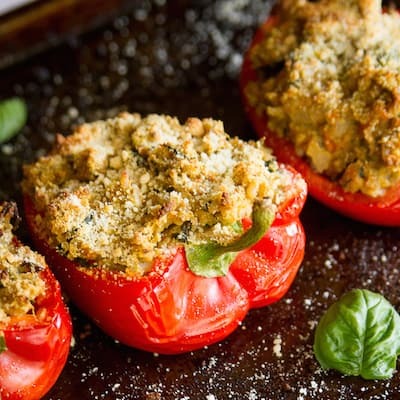 I think I’ll make the quinoa stuffed peppers too this week.